It sure does. I remember finding some of the series 4 episodes very weak. They had their moments, but lacked something extra special with the exception of Wild Justice, Blackout and the all-action Kickback. From Discovered In A Graveyard onwards, it got much better. Well, S4 started with 'The Gun', a really poor episode. It could only get better! I remember you saying once that an episode like that wouldn't have been suitable for any series, mias, although maybe something like that could have been done on The Bill, but without the cold-blooded violence we see (the addict getting shot, the gun accidentally going off and Gary getting shot). Luckily we had Wild Justice and It's Only A Beautiful Picture had some very enjoyable, funny moments. Yes, 'The Gun' does have a feel like 'Stake Out' that it was written for another series. That's right. Not A Very Civil Civil Servant was like that too. NAVCCS had some great Bodie and Doyle moments which saved it from being a dud. 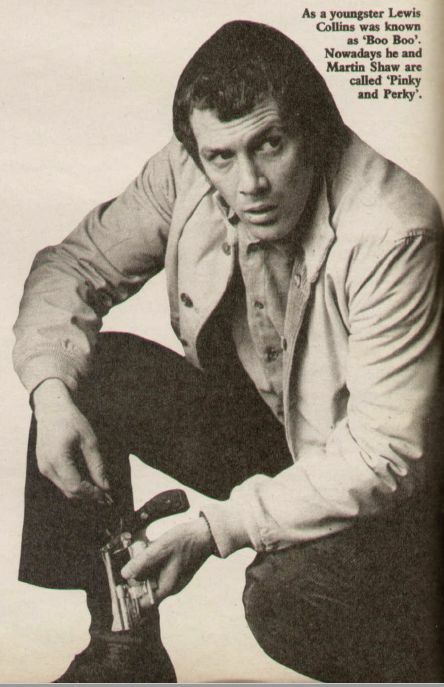 I couldn't believe David Wickes co-directed Stakeout. His other Pros episodes were top drawer. I might have a lead on Ms Beckley - 45 informed. Hey, that's great news. I hope she is able to talk. It's a very very weak lead and nothing concrete to suggest it is her 100% - the rest (aka hard work) I leave to my trusted authority on all things Pros 45doyle! Nice feature about Lew from TV Times when he starred in Jack The Ripper and there's also mention of his extra-curricular activities. I discovered this in one of my spare rooms recently. I had photocopied this at Liverpool Central Library in 2009 or 2010 a few years before they had a scanner installed. They sure were. You can find stacks of them at Liverpool Central Library. What a pity Martin Shaw and Lewis Collins weren't prepared to reprise the series. I know Lewis was initially named for The New Professionals (eventually given to Edward Woodward). It would obviously mean Lewis taking the Cowley position and Martin perhaps a Minister - or vice versa - but even a cameo role would have give the New Pros more gravitas. I have a feeling that Lewis couldn't take the role because of contractual obligations elsewhere. A panto seems to ring a bell. Apparently, he was quite upset that he couldn't take on the role in The New Professionals. One gets the feeling it was an opportunity lost for both Martin and Lewis. Shame. 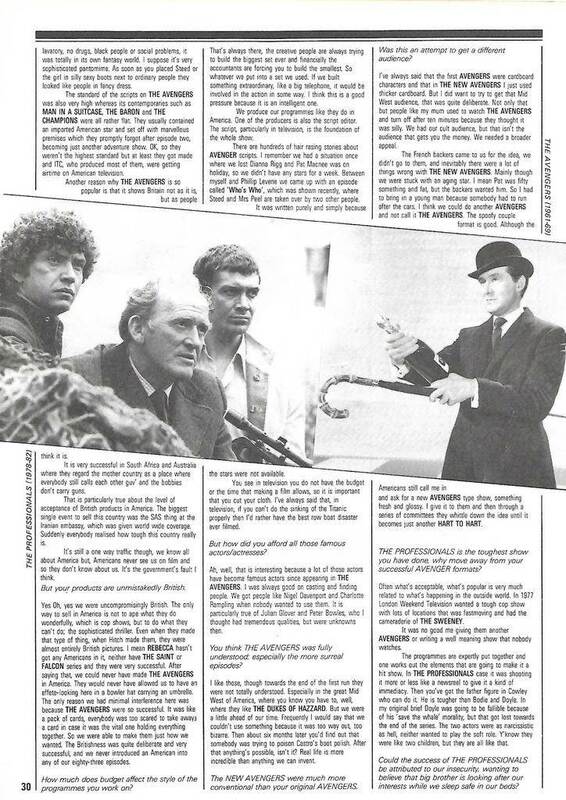 Now that Brian Clemens is sadly gone, I'd like to see a one-off series of possibly 12 episodes... and here's the genius bit (well, it's alright). The script written by Jimmy McGovern. I genuinely think he could transform an updated version - and hopefully persuade Martin Shaw in as head of CI5. I have to agree with this pp. I mean, I love Edward Woodward and I really think he did a top job as Malone, but one of the originals really would have given it the extra vibe. Admittedly we get the Cowley photos but oh how I long for Bodie to be in it, just for 5 minutes. For it to work, it would need a writer not previously connected, hence why I think Mr. McGovern would be ideal. He could add some real grit and added realism to any new production, given how good 'Cracker' was. Big fan of that series. This reminds me of RULES OF ENGAGEMENT, a one-off 1995 TV movie about a futuristic police task force which was written by the late Geoff McQueen who created THE BILL. 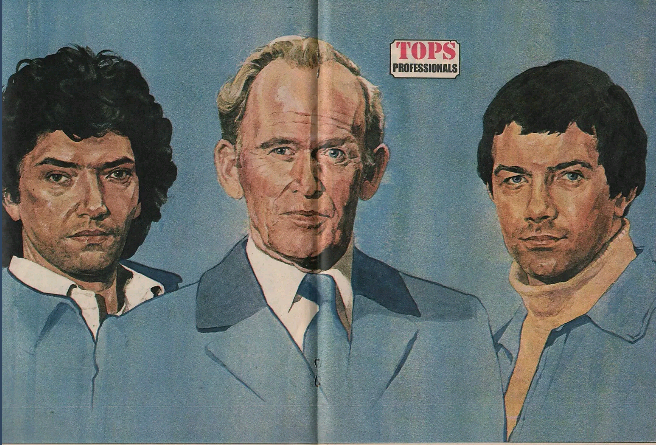 Sadly, I've never seen this and Network sent me an e-mail replying that they didn't have the rights to it (it was made by Yorkshire TV), but I get the distinct feeling that they were attempting a modern spin on The Professionals with this as this particular organization operated above the normal police and could take on terrorists, drug barons and organized crime. 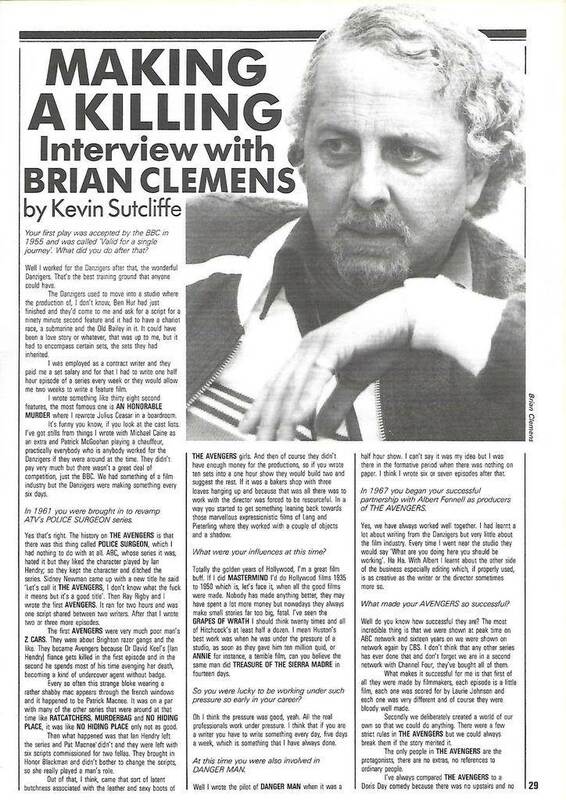 Interview with Brian Clemens taken from a 1984 issue of PRIMETIME. He talks about The Professionals. 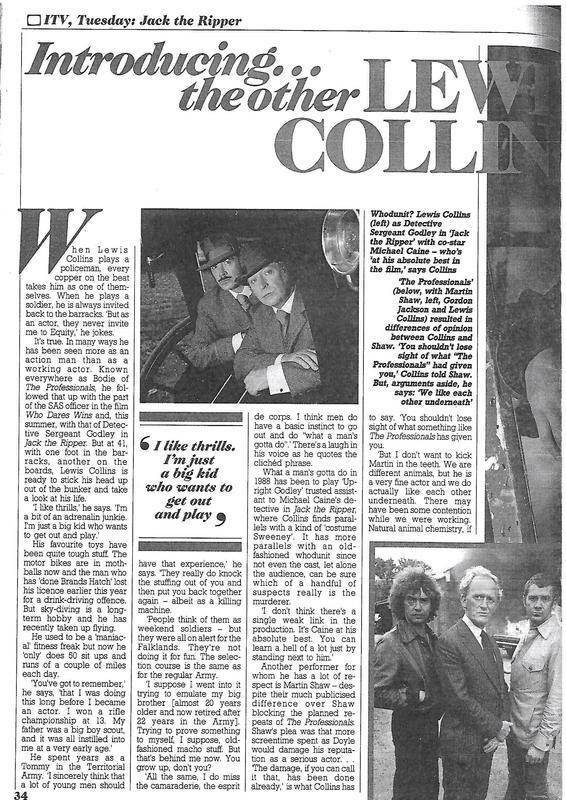 Thank you dscarter1975 for posting the Brian Clemens interview. A message to all the troublemakers, louts and terrorists in this country. Take note, Theresa May. 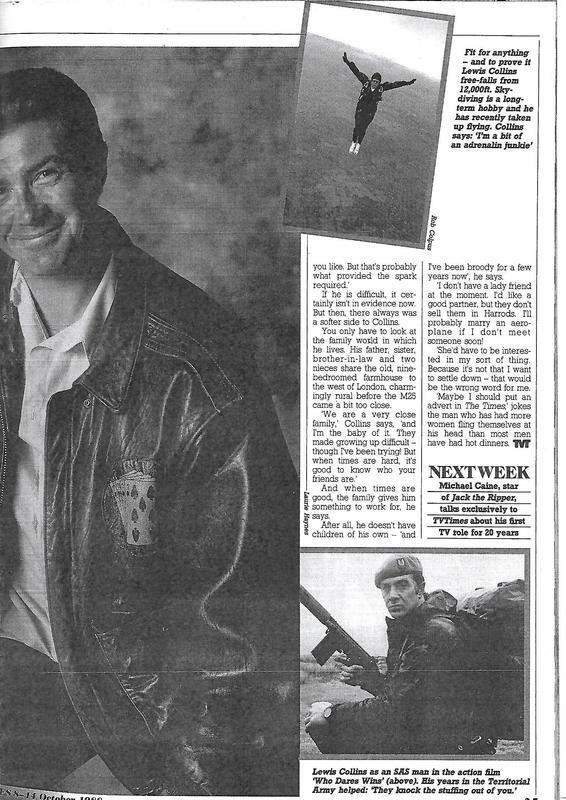 I think that was a promo pic from Operation Susie which hadn't been shown yet on ITV until later that year. This would have made a brilliant episode, I reckon. Also, imagine if Who Dares Wins was a Pros story. 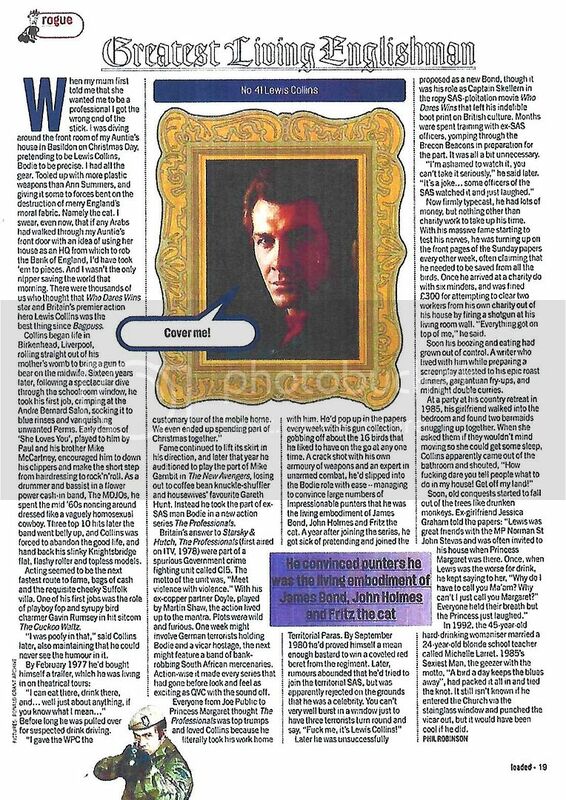 Loaded magazine's tribute to Lewis Collins. I think you're right dsc. What programme/film is it from?